Just updating with a new piece of work, which went live all over internet-land a day or two ago. 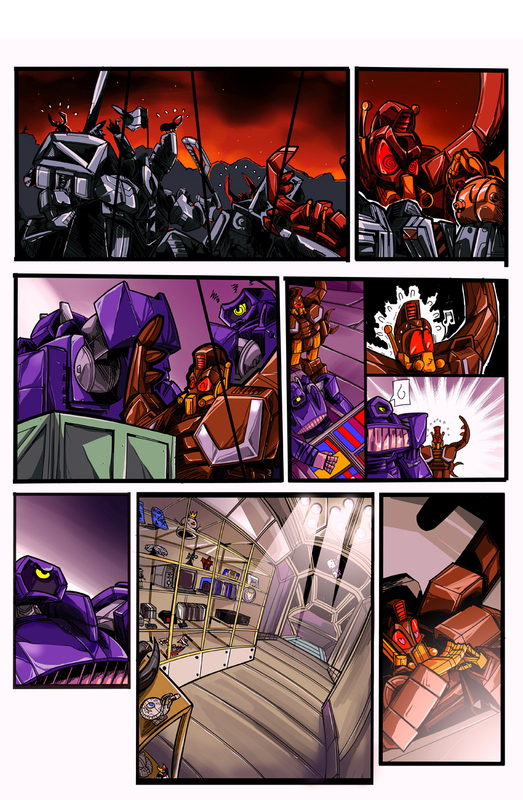 This page represents my penultimate contribution to the Transformers Mosaic project, before the lights are switched off and the chairs are stacked atop the tables. Sniff! So sad! Anyhoo, I figured it’s worth giving this piece some special attention on my blog, as it was one of the most challenging pages I’d ever worked on for the project. Perhaps it lends itself well to a little consideration of exactly what it is that the letterer’s craft entails, and some of the tough choices they have to make along the way. So, without further ado, here’s the piece, ‘A Modem Of Value’, written by Rob Queen. All other relevant credits can be found within the piece itself. Hopefully, if I’ve done my job correctly, everything reads easily enough and makes for a logical page flow. I’ve certainly got no complaints with the work done here. But this page REALLY kept me on my toes. It’s a very full page, lots of dialogue, and a fair number fo different balloon and caption designs required, not to mention some SFX. That’s not a bad thing, by any means, as it keeps the work varied and gives me a chance to try different things. Just check it out – we have regular speech balloons, a dialogue caption, a thought bubble, computer captions, a straight narrative caption, inner dialogue and even a ‘fin’ placecard. Possibly, this is one of the busiest pages I’ve ever lettered! However, the biggest problem I had with the page was simply fitting everything in. When lettering for print, there’s a certain amount of leeway to use smaller font sizes. If you’re a Transformers fan, just check out IDW’s ‘Spotlight: Ramjet’, which features some teeny tiny text that never feels unreadable. A good call there by the book’s letterer, Chris Mowry – who I seem to be bigging up an awful lot lately. Ah well – he gets too little credit! The problem here, though, is that the Mosaic strips are intended for online publication. That means working at web display size – 72dpi resolution, 1300 pixels by 850 pixels. This is pretty unforgiving, as the point size of the lettering can only go so small before it pixellates, mushes out and becomes unreadable. As you can see, the available space in some of these panels is quite tight, so some careful judgement had to be used to keep the lettering from obscuring anything that might be vital to the story. Several things make this tricky, and I’m going to elaborate as to why, in the hopes that somebody somewhere will find it useful. I’ve taken to editing comics pages for a few willing folks lately (and you can hire me to do this for you – but that’s another story!) and, while my editorial eye wasn’t requested to look this page over beforehand, I can at least share with the blogosphere some of the alterations I might have suggested. First up, for a single page, there are a LOT of panels here. Thirteen, in fact! When you consider that the current industry norm seems to be between 5 to 7 per page, you might see how things can get a little cramped. However, there ARE ways to manage this sort of layout successfully. Within the sphere of Transformers comics, you could take a look at IDW’s Megatron Origin, which features a lot of very busy pages. Several #1 issues in DC’s ‘New 52’ relaunch feature similarly dense pages, perhaps as a result of the books dropping from 22 to 20 pages per issue. In any event, it CAN be done, but it helps a great deal if the dialogue is minimal, or of sensible length. And while I wouldn’t suggest that Rob Queen did a bad job with the one pager above, I’ll admit that I saw the content of some of these balloons, along with the panel count, and wondered ‘Jeez – how the hell am I gonna get all that IN there?’ I always prize characterful dialogue over something more brief, though, and for this reason, I wasn’t inclined to ask for a re-write. Were I presented this to edit at the script or thumbnail stage, I think I’d err on the side of splitting it across two pages. It could comfortably be done that way, and allow the artist lots of room to breathe and enjoy his craft. However, the Mosaics don’t run to two pages. Ever. Thankfully, Kluyten is no slouch, and the decision to meld panels 1 thru 4 and later 6 and 7 together really works. Notice where I placed the balloons in those panels. This is simply the most logical way to do things without scarificing anything vitally important to the story. I very puprosely cropped them to the angled sides of the mini-panels to ensure that the reader knew they were reading a scene within a scene. Cases like Panel 8, however, break my heart. There’s just no way to fit everything in without covering character art, as you’ll see from comparing the two pages. I hate to do this, as my instinct as the letterer is to work in tandem WITH the artist, and allow their work to shine through. Whenever I have to cover character art, I always feel badly for them. It’s worth noting that a common problem I see with small press shorts and submission packages is that some artists seem oblivious to the fact that they’re drawing a COMIC, as opposed to a set of illustrations. There needs to be space for the dialogue. Some artists get this, but fail to allow anywhere near enough space in their panels as would be appropriate for the amount of text in the script. This is a mistake that EVERYBODY makes to some degree as they’re honing their craft. Thumbnailing is the answer! You can plan out so much and spot so many potential problems that way. A good rule of thumb is to leave the top third of your panels empty, but always check to see if the script calls for an immense block of text, just to be sure. Never – and I mean NEVER – fill a panel entirely with character art, unless there’s some way of allowing room for the lettering. The final row of panels reads very clearly, and panel 12 is a real treat – lots of neat easter-eggs there for sci-fi fans! It’s certainly a high point of the page. However, I do wonder why the layout here is so irregular, with white spaces beneath panels 11 and 13. It’s not a problem that affects the way the page reads, or spoils the fun, but I’d have been inclined to suggest the panel borders extend fully to the end of the page. Squeezing and constricting the artwork into a smaller space is never a wise thing to do. Dead space is good. Apart from giving the letterer a nice little pocket to work his trade in, it can also serve to make your page composition a little more spacious. More space is good. You don’t want your reader having to come up for air between pages! These observations not withstanding, I think everybody involved in the creation of the strip can be proud of their achievement. It was certainly well received online. While I can post here about how I’d have suggested it be done differently, it stands as object proof that 13 panels on a page CAN be done. Your team just have to have some clue about what they’re doing!